The New York Times yesterday reported on a new friends-of-the-court brief by the US Department of Justice about gene patenting. The brief correctly asserts that merely isolating DNA does not change the DNA from being a “product of nature” and so unpatentable. New and useful methods of identifying, isolating, extracting, or using genes and genetic information may be patented (subject to the prohibition against patenting abstract ideas), as may nearly any man-made transformation or manipulation of the raw materials of the genome, such as cDNAs. Thus, the patent laws embrace gene replacement therapies, engineered biologic drugs, methods of modifying the properties of plants or generating biofuels, and similar advanced applications of biotechnology. Crossing the threshold of section 101, however, requires something more than identifying and isolating what has always existed in nature, no matter how difficult or useful that discovery may be. They do try to allow patenting of manipulated DNA, which is overall a valid goal. But I think that they err in claiming that all cDNA is such a manipulated DNA, and so patentable. My belief is that DNA sequences should be patentable only if the sequence itself has been manipulated: that there has been some change from the “wildtype” sequence that occurs in nature. Since cDNA is just a transcription of naturally occurring RNA sequences, it should not be patentable just because it has been transcribed. Otherwise we get into the silly situation where writing down a natural sequence makes a patentable object, because it is now in a different format. Industrial and medical applications of DNA, RNA, and proteins should be patentable, even if the underlying sequence is a product of nature and not patentable. Inventions should be patentable, but discoveries should not be. The friend-of-the-court brief does not go quite far enough in removing the ludicrous patentability of genes that is currently practiced by the Patent and Trademark Office. They continue to focus on the chemical nature of the gene and not its information content, thus missing the main point of DNA. One even suspects that they were bending over backwards to retain the patents for friends of theirs (this is the interpretation of their action as being corrupt, rather than simply stupid). Lots of bloggers talk about things being “below the break” which appears to be a reference to the fold in newspapers, which puts the headlines and beginnings of stories on the first page, visible on top of a pile of papers or in a vending machine, but the continuation of the story on the lower half of the page, hidden from the casual viewer (generally requiring purchase to see). This concept makes no sense on a blog, as each viewer may have a different size screen and see different amounts of the beginning material of the blog. Those who read through an RSS feed may see a completely different view than those who read the blog directly. A similar problem is seen in many web page designs, which seem to assume that all readers have the same screen size, the same fonts, and the same browser. I prefer a lot of the older, simpler web pages, which left most of the formatting to the browser, rather than trying to micromanage the appearance. My eyes are not as good as they once were, and I sometimes like to increase the font size by a couple of points for readability, or force black on white for legibility. Many web pages have such complicated fragile formatting that they break if you attempt to make them readable in these ways. As you may have noticed, the blog format I’m using is “Rubric” by Hadley Wickham, which is a flexible-width format, so that readers can view the blog at whatever screen size they choose, and can (if their eyes are old like mine) increase the font size for comfort without messing up the blog. On Sunday 17 October 2010, my family and I needed to get from a family reunion in Champaign, IL (after the wedding of my nephew the day before near Danville, IL) to O’Hare airport to catch a plane. On a recommendation from my father, we booked three seats on the Lincolnland Express bus from Champaign to O’Hare. He had had good service taking the bus between Bloomington and the Chicago suburbs. We did the right thing, booking our seats a week ahead of time on the Internet, as the bus company told us to do on the web site. The website also suggested that we call to confirm that the bus we were taking was running, so we called the night before and were assured that the bus was running. When we got to the Illinois Terminal in Champaign, we waited around for the bus. We were pleased to see that Illinois is still building train stations, as California seems to be more in the mode of tearing down old ones and replacing them with useless bus-stop-style places to wait in the cold and the wind. When the bus did not come at the scheduled time, we waited some more. When it was 15 minutes late, we called the bus company and again inquired about the bus. They assured us it would be there shortly. It finally came over half an hour late, but we had left enough time at O’Hare that if the bus ran just half an hour late we would be fine, so we boarded the bus. 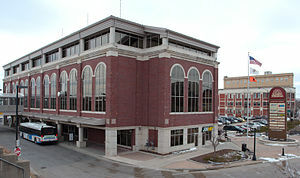 Illinois Terminal in Champaign. Image via Wikipedia. Unknown to us, despite 3 calls to the bus company specifically asking them, the company had canceled our bus and merged it with the next run which had more stops and took much longer to get to O’Hare. The company did knowingly cancel and merge the bus runs, since the driver had one list of passengers combining the ticket sales for both runs. That bus stopped at every shopping mall between Champaign and O’Hare (and several that were far out of the way). The bus ended up 45 minutes late for the next bus after ours, which was an hour and 30 minutes late for when we had planned to arrive at O’Hare. Our plane had started boarding before we got to the security line (which was quite slow at O’Hare), so we missed our flight by a lot. We were not the only bus riders to miss our planes—there were at least 4 others on the bus who got to the airport an hour and a half after the scheduled time, and probably missed their planes also. This all was irritating enough, but what made it worse for us was that we had had an alternative, if the bus company had just been honest with us on any of the times we had called them. We could have begged a favor of my sister, who would have driven us from Champaign to the airport. We would have owed her a favor, but we would have made our plane with hours to spare. As it turned out, we had to rebook our American Airlines flight, taking a less convenient flight that changed planes in Dallas and got the last plane into San Jose the next day (there were no more that night, and all the reasonably convenient flights were overbooked). This cost us $165 plus 75,000 frequent flier miles (which I estimate as worth about 1 cent each, so about $750 worth of miles). We only got $165 back on the unused tickets, which could not be applied to the rebooked flight, but only as a credit for some mythical future travel. We also had to pay about $155 for a hotel room near the airport, and about $60 extra for airport food the next day. Luckily, we were able to change our ground transportation in California, and we did not have to pay double for that. So we’re out of pocket about $1000 for the delay (in addition to the $45 each for our tickets), making this the most expensive bus ride I’ve ever taken. Given the 2-page disclaimer they make you sign when you buy a ticket from them, I doubt that it would be worth the effort to try to get any recompense from them. It is probably more useful to go to various travel advisory services and post warning messages not to believe them when they say that their buses are running on schedule. I was also able to contact colleagues and could get coverage for the two classes I missed by the unexpected delay. Unfortunately, the delay also meant I missed the field trip to MBARI, which I’d been hoping to join this year. Bottom line: Linconland Express is not a trustworthy bus company—take them only if you don’t care when you arrive. The next time I have occasion to go to University of Illinois in Champaign/Urbana or Illinois State University in Bloomington, you can be sure that I will not be giving my business to Lincolnland Express. I posted earlier about using the Wayback machine to find stuff that had disappeared from the Web. In the example there, I found a rubric for which the URL was known, but for which the hosting web server was down. Just a few days later, almost the same problem came up on the same mailing list, but with a different URL. People were looking fo an animation that used to be at http://207.207.4.198/pub/flash/26/transmenu_s.swf and once again the Wayback machine easily found archived copies (such as the one at http://web.archive.org/web/20060614121509/http://207.207.4.198/pub/flash/26/transmenu_s.swf). This was sort of boring, though, and I was beginning to wish for a lmstwmfy (let me search the wayback machine for you) site like the lmgtfy (Let Me Google That For You) site. Sherman here! I am trying to use the wayback machine to find the companion animation for the one that you just found. I do not have its address. It is on DNA replication and goes through all the steps in the replication process, reviewing all the enzymes. It is made by the same group as the one on RNA transcription and translation that you posted. If you could help me locate it and post it, many would be VERY happy. This is more interesting, because the Wayback Machine does not have full indexing, so I needed to find a web page that no longer exists, based on it being related to another webpage that no longer exists. As I expected, Google was very helpful here. Teachers frequently bemoan the fact that students don’t seem to be interested in learning, but just in getting points. Teachers try to find ways to make grading schemes more meaningful, so that students will care more about learning. Currently fashionable is Standards-Based Grading, which is good for a reductionist analysis of topics, but not so strong on synthesis. SBG also has trouble measuring sustained performance. Lee Sheldon, at Indiana University, has taken the opposite track and embraced point chasing. He doesn’t give grades—he gives experience points. Students earn points for quizzes and for both individual and group projects. I don’t know whether he has different levels in the class, with a certain number of experience points needed to unlock the next level of learning. If I used an XP-based grading system, I’d certainly structure the class that way! Experience points might be a good way to encode a rubric, with different XP values for different core tasks and bonus tasks. Assignments would have to be structured so that essential material has to be done (to at least some minimal standard) before any bonus XP can be earned, so that students don’t get lots of bonus points for bells and whistles if they don’t have the core ideas solid. XP could also be awarded for unanticipated student achievements, which is difficult to do in percent-based grading systems. students know that they are not penalized for not doing extra, and can be assured that they can still earn an ‘A’ on an assignment by doing a good job of the problem as specified. Personally, I feel that doing a good job on the problem as specified is B work, and that only by going above and beyond the minimal specs can one earn an A. If I were to use an XP-based system, the grade for the course would be based on the total XP earned, and merely “good” work would end up being a B.